Regional School Unit 2 will seek bids for the project soon now that the state Board of Education approved it last week. MONMOUTH — The state has agreed to pay for the construction of a school here, a project that will replace the town’s middle and grade schools with a new, 70,000-square-foot facility that will stand next door to the town’s high school. Regional School Unit 2, the district that includes Monmouth, now plans to seek bids for the project and hopes to break ground in July, according to Superintendent Bill Zima. 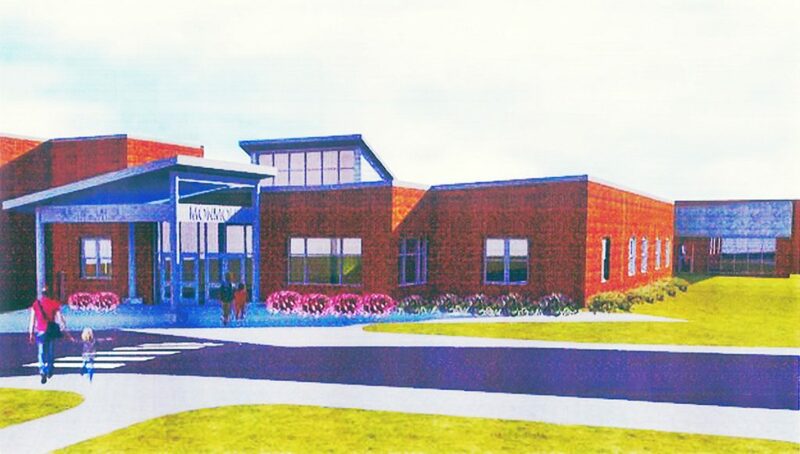 Depending on the speed of construction, the new school could open as soon as January 2020, replacing Monmouth Middle School and Henry L. Cottrell Elementary School. The district has been focused on getting that funding for almost a decade, since the state ranked Monmouth Middle School ninth on a list of facilities in such poor shape that it would pay to replace them. The school was first built in 1856, then expanded multiple times in the 20th century. The result is a structure that’s increasingly difficult to heat and navigate, with sloped floors and a locker room that students must pass through to reach some classes, among other problems. “I think the Monmouth Middle School is definitely in need of being replaced,” Zima said. Along the way, RSU 2 also sought approval to fold the grade school into the new building. The total cost of the project is $26.7 million, including the purchase of land on Academy Road where the school will be built. The state has agreed to pay almost all of that, except for $71,995 that the district had to spend on the new site. RSU 2 has taken out a bond to fund the project and, as it starts paying that bond back next year, the state will reimburse the district for the costs, according to Zima. Construction of the new school will cost an estimated $20.7 million. Other costs include permits, soil testing, purchase of the land, and the design of the project by Oak Point Associates, a Biddeford architectural firm. The school will be built on Academy Road, next to Monmouth Academy. That proximity, Zima said, will give the facilities “a campus feel” that supports the district’s use of proficiency-based learning, a method of educating and evaluating students that has been required under Maine law. If students at one school are ready to take classes at a higher level, it will be easy for them to walk between buildings, Zimas said. The proximity also will cut transportation costs if school buses can drop all students off in one area. Zima estimated that about 400 students will attend the new school, which doesn’t have a name yet. The district hopes to save 75 percent in maintenance costs and 40 percent to 50 percent in fuel costs once the new school is complete. Monmouth and the other communities in RSU 2 — Hallowell, Farmingdale, Richmond and Dresden — each approved the plan to replace the aging Monmouth schools during referendum votes last November. The town of Monmouth has formed a committee to decide whether it wants to acquire the old middle school and elementary school once they have been vacated, but RSU 2 will continue to operate those schools until the new one opens.